अन्ना, जेएस वर्मा की यही ईमानदारी है! 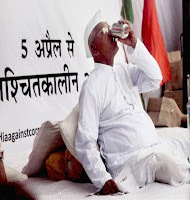 Anna Hazare’s sitting on indefinite fast in Delhi has galvanized the middle class of this country, which is most vocal against corruption but also the one responsible for most corruption in this country. Corruption is a very contentious issue. Our morals tell us to oppose it but for convenience we often make a compromise, always giving ourselves the benefit of doubt. Former Prime Minister Chandrashekhar used to say that corruption can never become a political issue in this country. Yet, this country saw how Vishwanath Pratap Singh rode on a wave of anti-corruption campaign in the context of allegations of kickbacks in Bofors deal to displace the Congress Party from power at the centre. Civil society wants a law which can punish the guilty within two years, recover the money made in corruption and includes Judiciary in its ambit. Obviously anybody part of the system would be jittery with such proposals. The government lack the will to accept the ideas of civil society because all political parties thrive on corruption. In fact, corruption sustains their politics. To accept the civil society proposal would mean radical changes in the way politics is carried out in this country. The civil society wants just that. Cleanse the sytem of corrupt. A theoretical question raised by some is how could the civil society put pressure of the government to make a certain law, not to talk of proposing a draft for the bill. It is being argued that it is prerogative of legislature to make laws. But when the people have lost faith in the legislature then what recourse is open to them? They could have reposed faith in Judiciary but then Judiciary too is fast losing its sheen. The senior advocates Bhushan father son duo claim that more than half the past 15 Supreme Court chief justices have been corrupt. When the people see the Legislature, Executive and Judiciary taking them for a ride and media too being coopted by the corrupt system, they have little choice but to demand participation in decision making. National Advisory Council is body consisting of some civil society members which was formed during the tenure of last government. It has played very important role in drafting wonderful legislations like the RTI and NREG. 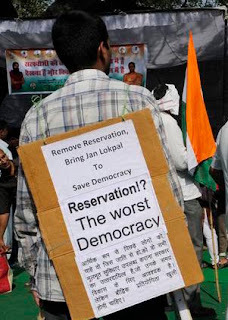 So, the question is why cannot members of civil society, outside of NAC, or in other words not people of government’s choice, draft a Lokpal Bill? Actually, NAC has already undertaken an exercise to formulate a draft of Lokpal Bill which is palatable to the civil society outside NAC. The version is closer to the one being proposed by Anna Hazare’s campaign than the government’s version. The government is reluctant to allow civil society members, not of its choice, become part of the drafting committee of a Bill lest it might set a precedent and civil society might start demanding its share in drafting of every legislation. But the government must realize that the situation to come to such a pass because of the nature of people who dominate politics these days. A relevant example is Sharad Pawar being made a member of Group of Ministers to consider drafting Lokpal Bill. Anna Hazare ridiculed him saying how can a corrupt minister be part of the drafting team of an anti-corruption legislation. The pressure created due to Anna Hazare’s statement in the backdrop of a nationwide movement forced Sharad Pawar to resign from the GoM body. The days of representative democracy are over. With RTI people had access to information, which was until then a prerogative of only the ruling elites. Now people want a role in decision making. There is no way government can resist the pressure for very long. Hopefully, this is the beginning of change of political character of this country. With things becoming transparent and open questioning of the corrupt, there will be no incentive for the corrupt to enter politics. The genuine politicians will fill the seats in Assemblies and Parliament. Right now it is the super rich, criminal and corrupt who are in majority. If instead of Party identity the MPs in parliament were to be divided between corrupt and non-corrupt, it is the corrupt who will form a government. Anna Hazare’s campaign has received tremendous support from common people, like the JP and VP movements previously did. But unlike the previous two occasions there is no political person at the helm who can guide it in the right political direction. It may be argued that inspite of very sanguine leadership both times in the past, the movements soon degenerated into something worse than they had set out to replace when actual governments were formed. This time is is more a non-political movment which aims at systemic reform. It does not aim to change the government. It wants to change the system. 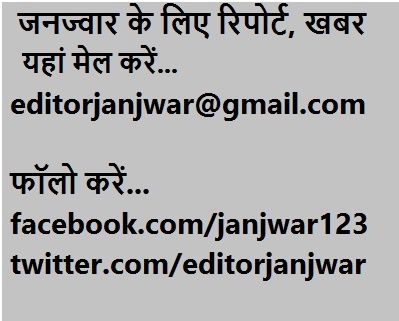 If Anna Hazare succeeds in this he will make a far deeper impact on the system than JP or VP did. The response Anna Hazare has received from youth is worth seeing. It is the same youth which was cheering the Indian cricket team till the other day at World Cup. But now it is involved in anti-corruption campaign with equal passion. It is the not the concern to make the system more user friendly. Most of this youth is either in comfortable jobs or will land with one soon. She is fired by the idealism to make the nation better. That is why a class of people who probably have never come out on streets for anything can be seen managing affairs at the protest sites and participating in them enthusiastically. They also have a recent experience to go by. They have seen what happened when people came out in Tahrir Square in Egypt. Of course, the computer sites, a favourite with the youth, have played a key role in mobilization, part of which is pouring in at the sit-ins. कानून बनाकर सिर्फ डर पैदा किया जा सकता है लेकिन असली सवाल कानून के अमल और बुराई के प्रति समाज में नफरत पैदा करने का है। उपभोक्तावादी और बाजारवादी विकास के मॉडल को अपनाकर हम ईमानदार तंत्र नहीं बना सकते हैं। एक तरफ लोगों को विलासी और ऐशोआराम की जीवन शैली के प्रति आकर्षित करने के अभियान चलाकर कंपनियां महंगा सामान खरीदने,विलासी और भौतिकवादी जीवन के प्रति लालसा बढ़ाकर ज्यादा पैसा कमाने की भूख पैदा कर रही हैं। जायज तरीके से होने वाली कमाई से हर ख्वाहिश पूरी होनी मुमकिन नहीं है,तब भ्रष्टाचार फलता फूलता है. क्या जिस मॉडल की कोख में ही भ्रष्टाचार पलता हो, उस पर पुनर्विचार नहीं करना चाहिए. एक और यक्ष प्रश्न है, कानून पर अमल का.भ्रष्टाचारऔर कदाचार के खिलाफ पहले से कानून हैं. जन लोकपाल कानून बन जाने से जनता के हाथ में एकऔर हथियार आ जायेगा. लेकिन जरूरत है इन कानूनों पर सख्ती से अमल की. अण्णा आन्दोलन सिर्फ जंतर मंतर पर हजारे के अनशन पर खत्मनहीं होना चाहिए. गावं में मनरेगा और दूसरी योजनाओं मन होने वाली पैसे की लूट, तहसील में पटवारी से लेकर तहसीलदार, विकास खंड में विकास योजनाओं के अमल में गड़बड़ी, थाना और जिला स्तर पर आम जनता के साथ रोज होने वाले अत्याचार और भ्रष्टाचार के खिलाफ भी जन जागरण और जन करवाई की जरूरत है. इस आन्दोलन से प्रेरणा लेकर अगर कार्यकर्ता अपने -अपने प्रभाव क्षेत्रों में निचे के स्तर पर कानूनों के अमल और लोगों के अधिकारों के हनन के खिलाफ स्थानीय प्रशासन पर दबाव बनायें तो भ्रष्टाचार के खिलाफ दूसरी आजादी जैसा गाँधीवादी सत्याग्रह हो सकता है. क्या ऐसा नहीं होना चाहिए. चलो देख आयें अन्ना का मेला..
किशन बाबूराव ऊर्फ अण्णा हजारे के आमरण अनशन का गुरुवार को तीसरा दिन था.उन्हें समर्थन देने वालों का जमावड़ा लगा रहा. इनमें चलचित्र जगत के कई नाम शामिल थे.जंतर-मंतर पर पिछले तीन दिन से मोमबत्ती ब्रिगेड सक्रिय है.जगह-जगह मोमबत्तियां जलाई जा रही हैं. इस दृश्य को अपने कैमरे में कैद करने के लिए टीवी वाले सक्रिय हैं.शॉट को और सजीव और जीवंत बनाने के लिए वे मोमबत्तियां और झंडे बांटते नजर आए.एक अदद बेहतर विजुअल का सवाल था. टीवी चैनलों को भ्रष्टाचार के भ्रष्टाचार विरोधी भीड़ में इतनी टीआरपी नजर आ रही है कि कुछ ने तो जंतर मंतर पर ही रस्सी और कुछ कुर्सियों पर के सहारे अस्थायी स्टूडियो ही बना लिया है. गुरुवार शाम एक ऐसे ही स्टूडियो में टीवी पत्रकारिता के महान स्तंभ कहे जाने वाले राजदीप सरदेसाई स्वामी अग्निवेश और लार्ड मेघनाथ देसाई के साथ भ्रष्टाचार पर चर्चा करने में मशगूल थे. वे देश में भ्रष्टाचार की जड़ें तलाशने और उसे काटकर सुखाने की तरकीब की खोज में जंतर-मंतर पहुंचे थे. ये वही सरदेसाई थे जिन्होंने संसद में वोट के बदले हुए नोट के खेल का स्टिंग आपरेशन करवाया था.इसमें उनके कई प्रिय और अप्रिय लोग शामिल थे, लेकिन स्टिंग आपरेशन के टेप को अपने दर्शकों को दिखाने की जगह माननीय लोकसभा अध्यक्ष को सौंपना जरूरी समझा था. मैं आज तक यह नहीं समझ पाया कि सरदेसाई की जवाबदेही किसके प्रति थी लोकसभा अध्यक्ष या अपने दर्शकों के प्रति. इसका जवाब शायद वही दे पायें. अगर कभी मिलें तो आपलोग पूछिएगा जरूर. एक बात पर आपको यकीन नहीं होगा लेकिन कसम से कह रहा हूँ कि गुरुवार को जंतर-मंतर पर अण्णा को समर्थन देने दूसरे ग्रहों को प्राणी भी पहुँचे थे.वे देखने में तो बिल्कुल पृथ्वीवासी ही लग रहे थे,लेकिन अंतर बस इतना ही था कि उनकी सींग थी.पूछने पर बताया कि पृथ्वी पर बढ़ते भ्रष्टाचार को बढ़ता देख वे यहाँ आने से खुद को रोक नहीं पाए.मेरा एक साथी तो उन्हें कौतुहलवश मुहँ फाड़कर देखता ही रह गया. वह ऐसे प्राणियों को पहली बार देख रहा था. अब जहाँ इतना बड़ा मजमा लगा हो कुछ लोग अपना फायदा देखकर आ जाते हैं(जैसे बाकी के लोग केवल देशहित में वहाँ पहुँचे थे). जंतर-मंतर पर भी कुछ ऐसे लोग पहुंचे. इनमें प्रमुख थे, रेहड़ी-पटरी वाले और कबाड़ बीनने वाले. एक कबाड़ी ने बताया, जानते हैं भइया, यहां जो लोग आए हैं उनकी हर चीज हाई-फाई होती है, जैसे वे कभी हैंडपंप या वाटरसप्लाई का पानी नहीं पीते हैं, जब भी पीते हैं बोतल वाला पानी ही पीते हैं. इसलिए मुझे यहां कबाड़ मिलने की उम्मीद थी. इसलिए मै जंतर-मंतर आ गया. आप देख ही रहे हैं चारों तरफ बोतले-बोतलें ही पड़ी हैं. इस बीच एक आइसक्रीम बेचने वाले भी अपना दुखड़ा बताने चला आया.उसने बताया कि आज तो इडिया गेट पर धंधा ही मंदा हो गया है.सब लोग यहीं आ गए हैं.सो हम भी चले यहाँ चले आए, आखिर पापी पेट का सवाल है. गुरुवार को अण्णा का आमरण अनशन कुछ रंग लाता दिखा.सरकार की ओर से केंद्रीय मंत्री और वकील कपिल सिब्बल अण्णा से बातचीत करने पहुँचे. उन्होंने इस अभियान में प्रमुख भूमिका निभा रहे अरविंद केजरीवाल और आर्य समाजी नेता स्वामी अग्निवेश से बातचीत की. सरकार अभियानकारियों की पांच प्रमुख मांगों में से तीन पर सहमत हो गई है. लेकिन दो बातों पर गाड़ी अटक गई है. इनमें से एक है जन लोकपाल विधेयक का मसौदा तैयार करने वाली समिति का प्रमुख अण्णा को बनाना.कांग्रेस नीत सरकार का कहना है कि इस समिति के अध्यक्ष कांग्रेस की परंपरा के मुताबिक वित्त मंत्री प्रणव मुखर्जी ही होंगे.दूसरी मांग समिति के गठन की अधिसूचना जारी करना है. सरकार इस पर सहमत नहीं है.अभियानकारियों का कहना है कि क्या भरोसा सरकार कल अपनी ही बात से मुकर जाए. 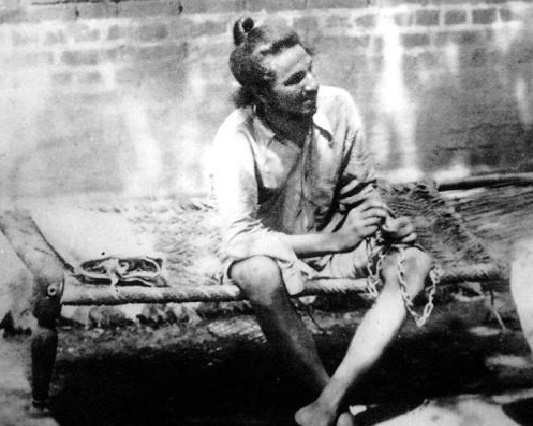 अण्णा भी मसौदा समिति का अध्यक्ष बनने को राजी नहीं हुए,वे चाह रहे हैं कि सुप्रीम कोर्ट का कोई पूर्व न्यायाधीश इसकी अध्यक्षता करे.इन बिंदुओं पर अरविंद केजरीवाल और स्वामी अग्निवेश, सरकार ऊर्फ कपिल सिब्बल से शुक्रवार सुबह एक और दौर की बातचीत करेंगे.इस बात की संभावना है कि सरकार इन मांगों को भी मान ले और शुक्रवार को अण्णा खाना-पीना शुरू कर दें, जय हो. जंतर मंतर पर कुछ ऐसे लोग भी मिले जिन्हें अण्णा के इस अभियान के पीछे कांग्रेस का हाथ नजर आ रहा है.उनका तर्क था कि काग्रेस अण्णा के दम पर काली कमाई और भ्रष्टाचार को हथियार बनाकर चुनाव मैदान में उतरने की तैयारी कर रहे स्वामी रामदेव और भ्रष्टाचार के नाम पर देशभर में रैलियां करने की घोषणा कर चुकी भारतीय जनता पार्टी को एक साथ निपटाना चाहती है. उनका कहना था कि सरकार जन लोकपाल विधेयक को लाकर राष्ट्रमंडल खेल,आर्दश हाउसिंग घोटाला,टूजी स्पेक्ट्रम घोटाला,एस बैंड घोटाला को ठंडे बस्ते में डालना चाहती है.लो भाई जन लोकपाल आ गया, अब वही इनकी जांच करेगा. इससे शायद 2014 की चुनावी वैतरणी पार कर जाए कांग्रेस. चलो, कोई नहीं कांग्रेस अपने राजकुमार के मिशन-14 के रास्ते का एक और रोड़ा हटाने में सफल रही.